…Information Resources and Library Science, like mine. A round up of the discussions happening around the web right now. Most of these post have a LOT of comments. Even if you don’t agree with them or the comments it is worth the time to read through them. 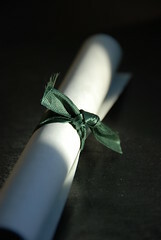 Andy Woodworth wrote The Master’s Degree Misperception and followed it up with The Master’s Degree Misperception, Ctd. Kendra added her thoughts with I Got a Degree So I Could Fix the Printer? Library MAs: insufficient preparation for the real world of information work? adds another UK perspective to the mix. In The Librarianship Qualification Niamh Page talks about what being a librarian means to her. nevermind I do have it, second from the bottom. Thanks for mentioning my post – I now feel famous!